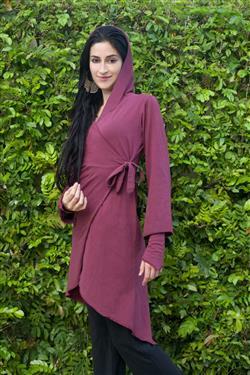 A must for every Goddess wardrobe, our Sweater Wrap is so versatile that it can look different every time you wear it! Tie it high or low, front or back, or just let it hang open, loose and free! Wear it with any of our Aum pants, skirts or dresses to create a new outfit for every occasion! Aum Style for your every mood and whim! Features : The perfect length for tying any way you wish, front or back. Sleeves gently flare at the wrist.